I had such fun with this one! These paintings were done from a photo taken by Joan Wells, a long time friend and former owner of The Queen Victoria, an inn in Cape May, New Jersey. Bill and I visited Cape May and stayed at the QV most summers and other times for a span of about 20 years, and during that time we got to know Joan and her husband Dane quite well. A few years back they sold the inn and now they are happily retired and traveling the world. The rest of us are living vicariously through Joan’s posts on Facebook. I used to only paint from my own photos. I thought it was wrong to paint from a photo taken by someone else. Recently I’ve broadened my perspective. I have friends who go to so many interesting places and are wonderful photographers. I’m now allowing myself to paint from some of those if they inspire me, but only if granted permission to do so. 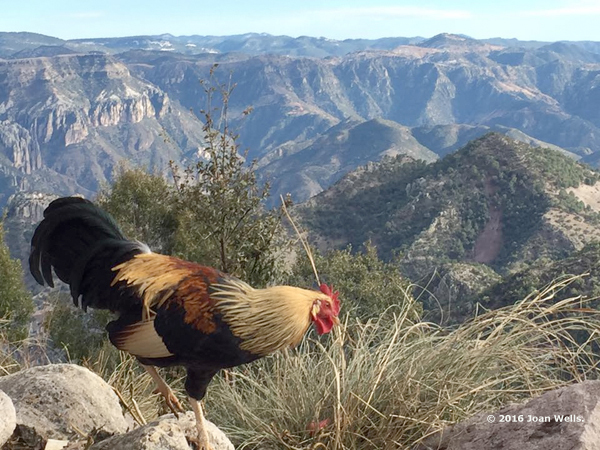 A few months ago Joan and Dane were traveling in Mexico and Joan posted a beautiful photo of a rooster walking along the edge of a canyon with a backdrop of cliffs and rugged mountains. I knew instantly I wanted to paint it and asked if she’d mind. Thankfully she said she was fine with me doing that. First I did a watercolor study. I’m not crazy about the background in that painting. I’m still honing my newfound watercolor skills. I do like the chicken. 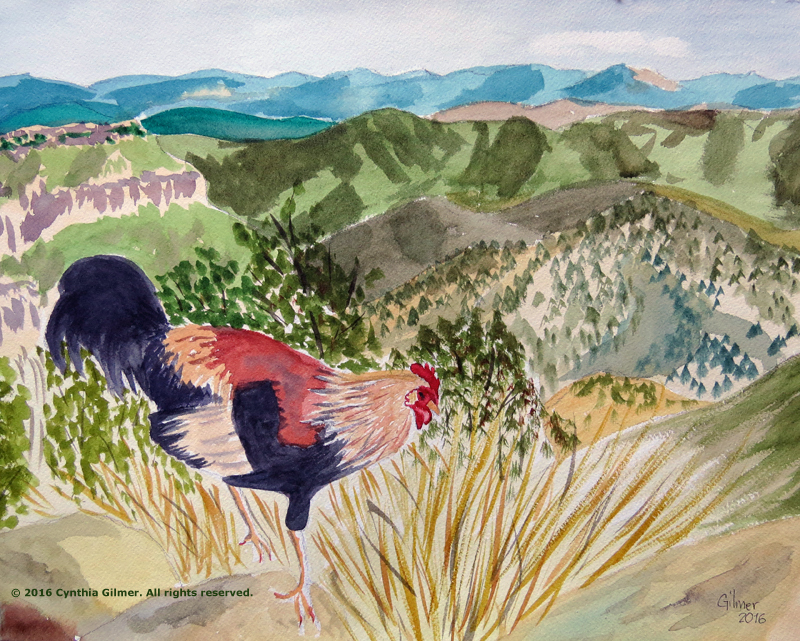 Doing the study allowed me to study the scene and become familiar with the details of the rooster. Then I did the oil version. 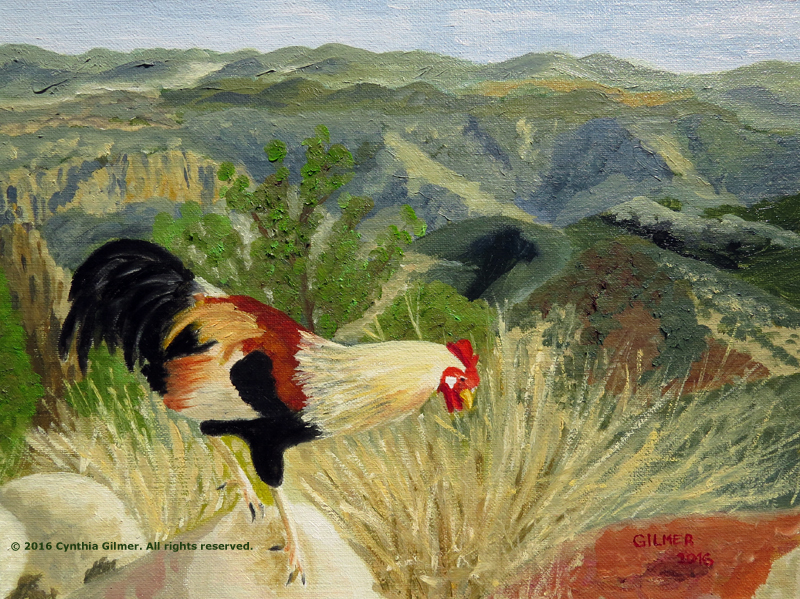 This is a small painting – it is on a 12×9 Belgian linen panel. I had the paint the background a couple of times to get the atmospheric depth. The earlier version didn’t grasp the feeling of the canyon because I didn’t capture the distance of the mountains on the other side. I now feel I’ve captured that feeling. I also love the rooster. The red sets off the painting. His plumage is quite colorful as well. Finally, here is Joan’s original photo. I hope I did it justice. Falls Church Arts has a show coming up in a few months called Whimsy. I’m not really sure what that means. I think I will enter this to see what happens. After all, what’s more whimsical than a free ranging Mexican chicken? 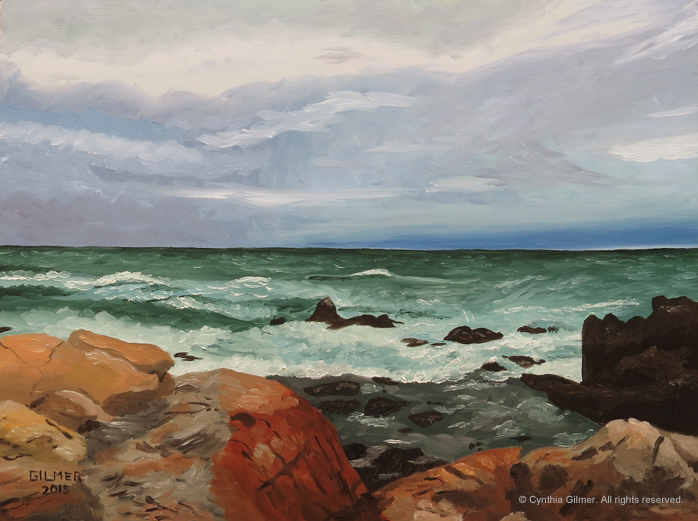 Speaking of Falls Church arts, I’ve entered the painting below, Carmel Sea, in this years’ All-Member show. The show opens Friday, April 1st. Unfortunately I will miss the opening because we will be in the mountains. I hope others can go. The Falls Church Arts All-Member shows are always very nice. We picked up the mail today and there was a check from Falls Church Arts. I didn’t have anything in a show, so it could only be for one of my prints in the print bin they have in the lobby of Art Space. It was! Someone bought a print of Monarch on Yellow. 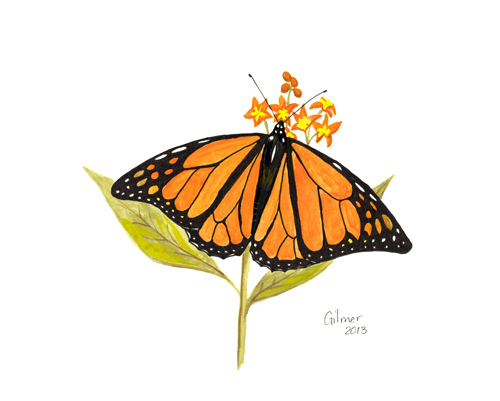 I’m pleased to know that someone liked one of my butterflies enough to buy it. The original for this is hanging in my office. It was done in gouache and ink. For anyone else who happens to be interested, my prints are also available for sale in my Etsy shop. I had a great weekend painting in the mountains. I even did a new butterfly — it’s been a while. I also have something almost finished here in my studio in Northern VA. I will be posting some new things soon!